Engineered solutions for connecting, monitoring, protecting power systems and critical equipment. The Multilin™ 845 Transformer Protection System is a member of the Multilin 8 Series protective relay platform and has been designed for the protection, control and management of 2- and 3-winding power and distribution transformers in both utility and industrial applications. The Multilin 845 provides advanced functionality for a wide range of transformer applications delivering high-speed protection, customizable programmable logic, advanced transformer monitoring and diagnostics, and support for the latest communications protocols for easy integration into new or existing power systems. Advanced communications of the 8 Series platform allows easy integration into process and electrical control systems for smoother asset monitoring and control. 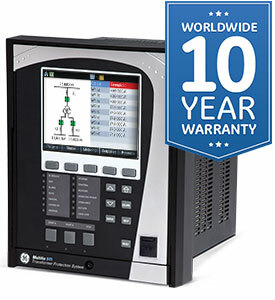 The Multilin 845 delivers comprehensive transformer health monitoring, diagnostics, and reporting with integrated connectivity to composite and multiple gas transformer DGA solutions such as, GE’s Kelman Transformer Monitoring devices, delivering actionable analytics for asset optimization and transformer life extension. © 2018, Chess Electric., All rights reserved. The GE Multilin, KoCoS, Meltric, Amran, Gentec, Tavrida Electric, MR Control Systems Logo(s) are trademarks or registered trademarks of their respective owners.